I hope everyone has a wonderful day with family and friends. Be sure to take time to say what you are thankful for and to tell the ones you are with how much you love them. Today's card is one I've entered in two challenges -Freshly Made Sketches and Hand Stamped Sentiments. I will post both inspiration photos and links below. You've seen me use the Spellbinders circles and pinked circles before. I love how when you nest the pinked circles, you get a super fun design. The one die I haven't shown to you before is from Memory Box . That delicate wooded branch is a made with a die. Isn't that awesome? It is so tiny and fine, but it cuts perfectly. The sentiment is from Joy's Life Stamps. Be sure to check out her sentiment line. It is just plain fantastic. I hope you like this little winter wonderland card. I can't wait to see what you come up with after you check out the two challenge blogs I've listed below. Well, I have pumpkin muffins in the oven and it smells like Thanksgiving here! I won't be shopping on black Friday, so I'll have plenty of time to come back and show you a brand new project. Beautiful! A wonderful winter scene! 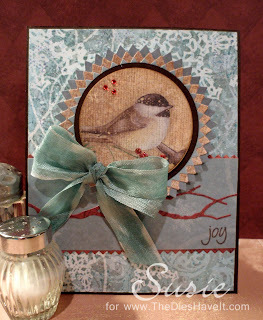 Love the little chickadee and great detailed on the dies and sentiment. Thanks for joining Freshly Made Sketches this week and Happy Thanksgiving! Amazing card! I love it! I love those pinked circles! Beautiful card! Beautiful snowy card Susie! I adore how you layered the frame around the bird, makes for such an awesome presentation piece, front and center! and that little twig is snappy! :) Hope you enjoyed your muffins, Happy Thanksgiving! Thanks for playing along this week at Hand Stamped Sentiments! What wonderful card, Susie. The pinked circles show off the chickadee so well! And wouldn't you know it, the chickadee is the state bird of Massachusetts (where I'm from)! Thanks for joining us at Freshly Made Sketches! Wow, how beautiful! I love that little branch die. Gorgeous papers! So glad you joined us this week at Freshly Made Sketches! So pretty!! I love the layering of the pinked circles and how it looks like everything is resting upon that cute branch. Such a lovely card and thanks for playing along with Freshly Made Sketches this week! What a beautiful card. I love it, especially the pinking. It is lovely. Wow! Really pretty. Love the images. Very well done. Thanks for playing with Freshly Made Sketches this week! Gorgeous winter scene. I love the circle frame you created for your bird image. The background and colors are beautiful. Thanks for playing at Hand Stamped Sentiments. Love the colors you chose. Great coloring on the bird. Thanks for playing with us this week at Hand Stamped Sentiments.